Calvert County was founded on July 3, 1654 and celebrated its 350th Anniversary in 2004. Prince Frederick is the county seat and was burned by the British in the war of 1812. Since those times, the little town has blossomed and is now an area of art galleries, shops, restaurants and a bustling farmer’s market surrounding the old Main Street. Calvert County is a beautiful green county with large forested areas and being situated close to the capital city Washington it is a popular place to live. The county is currently experiencing an interest in building development but despite this, the county has an eye on conservation and has a programme of preserving green areas. Calvert County was formerly a tobacco growing county upon which its wealth depended, this has now all but disappeared and ahs been replaced by a modern economy but many of the typical picturesque tobacco drying barns are dotted about the county. With abundant waterways, unique shops and museums, excellent restaurants, natural parks and a calendar filled with interesting festivals and activities, Calvert County has earned its nickname: "Charm of the Chesapeake". Solomon’s is located at the southern tip of Calvert County and is the home of the superb Calvert Marine Museum. Solomon’s Island came into being when Isaac Solomon established an oyster cannery and the town quickly became the centre of shipbuilding, seafood harvesting and a provisioning centre for the maritime community. Today Solomons is the centre of marinas, charter boat operations, water taxis and seafood that give the waterfront its character. The world class Calvert maritime Museum is located at Solomons and it is dedicated to the collection, preservation, research, and interpretation of the culture and natural history of Southern Maryland. The county has a long and rich maritime history and one of the most famous naval battles with the British took place on Calvert’s St Leonard’s Creek during the war of 1812 when a small fleet of barges under Joshua Barney defended the Bay against British invasion. The investigation of this lost fleet has been documented by Donald Shomette in his excellent book Tidewater Time Capsule. The waterways have provided a way of life for many generations but like the Yorkshire Coast, they have undergone a change and some decline in the maritime economy. 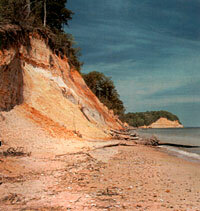 Calvert County has rich Palaeolithic deposits and in the cliffs at Calvert Cliffs State Park and Flag Ponds Nature Park there are large deposits of fossils formed over 15 million years ago. This page is under construction and will be improved.